Whether you are in the kitchen, camping, on a road trip, or simply on a relaxing vacation, having the right tools with you can always come in handy. One ever popular items is the multi-tool. Multi-tool products are known for having dozens of built in features that can be of use to you throughout any task. But, not all multi-tools are built the same. As with all items, there are always those that are better than others. 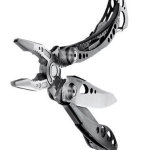 When it comes to the world of multi-tool products, one cannot deny that the cream of the crop is the coveted Leatherman New Wave Multi-tool. Below is a full review of the product, proving you with exactly what you need to know. The Leatherman New Wave Multi-Tool is designed by the famous Leatherman Company, known for its spectacular quality and durable products. 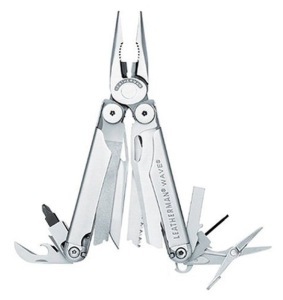 This particular Leatherman tool is one of the most popular on the market. It is made out of 100% stainless steel so you do not need to worry about rusting, while the tool itself features 2 pliers, 2 wire cutters, 2 knives, a saw, scissors, 2 files, 2 bit drivers, a screwdriver, ruler, bottle/can opener, wire stripper, and 2 double-ended bits. 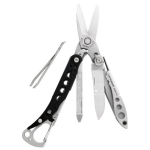 Essentially, the Leatherman New Wave is designed to be handy anywhere and anytime. Due to the quality and calculated design of this product, there are many great features that users have become especially pleased with. Below are the top featurse of this product. If you’ve ever had a pocket knife, you’ve probably noticed how annoying and difficult it is to open the entire tool just to use that one section that you need. Leatherman has taken that concern and engineered a new access system into its products. 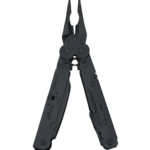 The Leatherman New Wave revolutionizes the way you access tools by making it easier. You now do not need to open the entire tool just to reach the blades you are looking for, as the exterior of the multi-tool is where the blades are placed. In addition, when you access the blade, you can also be sure that it is firmly in place, as once you twist it out it uses the Leatherman’s locking feature. Other tools also work in much the same way. You can access nearly anything individually. Multi-tools have many purposes, and it is not uncommon for them to find their way into situations where there is water and dampness. Rather than purchase a multi-tool and see it rust, the Leatherman is made out of 100% stainless steel, which means you do not need to worry that your investment will go down the drain. Most individuals purchase a multi-tool with the intention to use it in emergency situations, which means that the multi-tool needs to be extremely easy to use. This particular product works for your needs. The easy access and the ease-of-use allow you to respond to emergency situations quickly and without trouble, which is how you know you’ve got a reliable product on your hands. There is nothing like buying a good product, but what makes it all the better is when that product is covered by a long warranty. Leatherman believes in the products that it produces, which is why it covers them for 25 years. If the product has an issue or if you are not satisfied, Leatherman can take care of the issue for you. However, chances are that you’ll be so pleased with this multi-tool that such a scenario won’t happen. Finally, there are the specs of this product, which are also promising. When you choose a multi-tool, you deserve a product that is reliable, has variety, is convenient, and will last you a long time. The Leatherman New Wave does just that. With this multi-tool you can rest assured that you’re getting the value of your investment in return, and so much more.